Assign timelines, an overall one for for accomplishment of the goal, and then individual timelines, for accomplishment of each task. Nothing wrong with this formula. Except that I have found it doesn’t work well. Life happens, and it doesn’t take into account those twists and turns, nor does it take into account the extraordinary level of sheer stubbornness needed to accomplish things this way. Accomplishing goals this way seems like a gigantic battle. Not to mention....I’m a big girl.....if I can’t hold myself accountable for doing things in my life, no one else is going to be able to do so. Who are you? Who do you be? What are your beliefs and values? What is your purpose for being here? This describes your reason for being. What is your mission in life? This describes your short and mid range goals. What is your vision for your life? This will draw on your mission. I am a physical manifestation of spirit. My purpose for being here is to live in peace and joy, at my best and highest levels, and to help others do the same. My mission is to design and implement workshops, classes, retreats and other things to facilitate that peace and joy in others. My vision is that everyone live lives of peace and joy. This is my compass. It points me in a general direction, and as long as I am going in that general direction, I’m good. The steps, the map, might change. After all, maps need to be changed all the time. Global warming means water levels on earth are changing. Earthquakes mean topography changes. 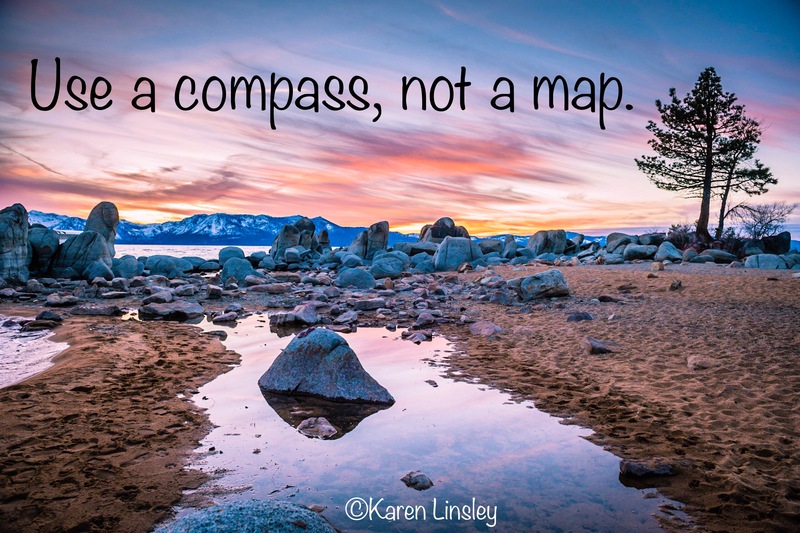 When stuff happens in our lives, the map changes. But the compass will always point us in the right direction. And having a formula like this in your life will accommodate the changing topography that happens in all our lives. As for that accountability partner, well, I prefer enthusiastic supporter. This would be someone who knows your beliefs and values, and who holds those beliefs and values upper most in their minds, and reminds you of them when you have forgotten them. In this way, you have the dignity that comes from empowerment that comes from taking personal responsibility for your life. No one else can do that for you.